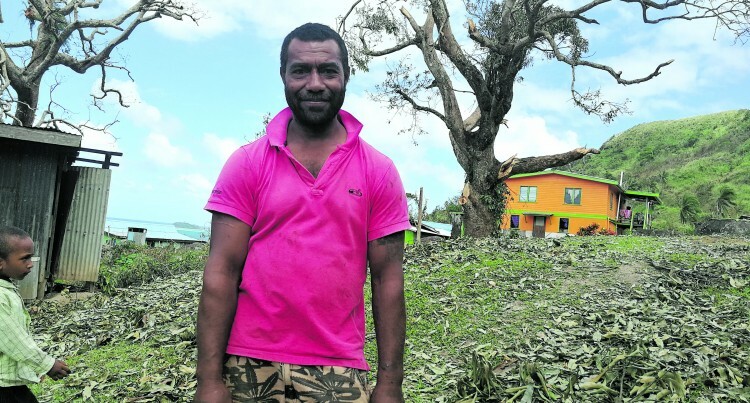 Ravitaki Village headman Vetai­ya Ratumaiyale says the damage inflicted by Tropical Cyclone Keni was similar to that of Tropical Cyclone Oscar when it hit their village 36 years ago. His village consists of 63 houses – 20 were partially destroyed while four were completely destroyed last week. “That day just brought back memo­ries of Tropical Cyclone Oscar in the early 1980s. As strong winds started blowing off rooftops and destroying houses, it just brought back memories of that horrific day,” Mr Ratumaiyale. The 43-year-old yaqona farmer said he was still in primary school when TC Oscar hit their village and memories of that experience was resurrected dur­ing the events of TC Keni earlier last week. Mr Ratumaiyale said most people in their village depended on yaqona farm­ing as their main source of income. “Now we are just trying to recover from the damage left by TC Keni. Over the past few days we have had to clear heavy debris. It is times like this that creates a sense of unity among us,’’ he said. According to records from February 23, 1983 when Cyclone Oscar struck, there were nine fatalities and total damage nationwide was estimated at US$130 million or FJ$264 million.